I really shouldn’t open a coin database on a day I need to prep teaching, its far too distracting. I’m keeping this post shortish just so I have a note of the issue. We’ve talked else where about the symbolism of the caduceus and its association with peace. 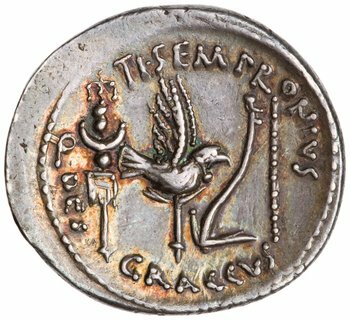 Given that, when I first saw this coin my impression was that branch behind Caesar’s head was an olive branch, but it’s labelled by Crawford a laurel branch. So after a bit of poking around I’m fairly convinced that republican engravers were quite sloppy about the difference between these two species in their numismatic representations. So for instance it’s mostly context that let’s us say these are olive branches not laurel branches, i.e. representations of peace (supplication!? ), not victory. 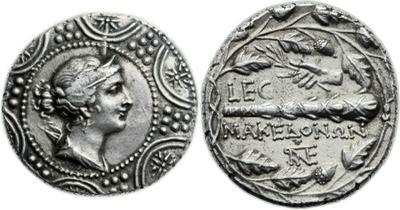 As an aside the Macedonian type is a great example supporting Clare Rowan’s thesis that Roman images of power were often created in the provinces (cf also the numismatic portrayals of the supplications of Bocchus and Aretas). Denarius, Sicily circa 209-208, AR 4.48 g. Helmeted head of Roma r.; behind, X. Rev. The Dioscuri galloping r.; below, staff and ROMA in tablet. Sydenham 208. Crawford 78/1. NAC 33 (2006), lot 204. Even though many bullocks ploughed your fields, the merciless measuring-rod stole your wealth of land. What the literary tradition suggests is a generally negative connotation of symbol. An emphasis on the confiscation aspects of its application. 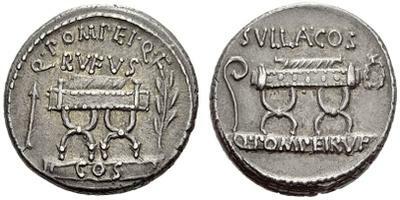 Could this really be a numismatic symbol? Is it just a staff? I’ve been a bit ambivalent, until today. 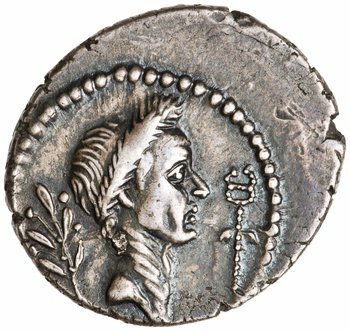 I was skimming for a good Caesar coin or two in the ANS database for my next class and came across this beauty. Outside the time frame of my book project, but still very interesting indeed. Here we have a young Ti. Sempronius Gracchus (quaestor designate!) trading on the reputation of his famous name by aligning himself with contemporary land distributions, particularly to Caesar’s veterans. Notice the Legionary standards set right next to a plow and our measuring stick. The flip side of confiscations is always distributions. The power of the measuring stick as political symbol is its appeal to those to benefit from the rearrangement of property holdings. Its power as a literary device is just the opposite. Not the least conspicuous feature of the spectacle was the sight of Sosis the Syracusan and Moericus the Spaniard who marched in front wearing golden crowns. The former had guided the nocturnal entry into Syracuse, the latter had been the agent in the surrender of Nasos and its garrison. Each of these men received the full Roman citizenship and 500 jugera of land. Sosis was to take his allotment in that part of the Syracusan territory which had belonged to the king or to those who had taken up arms against Rome, and he was allowed to choose any house in Syracuse which had been the property of those who had been put to death under the laws of war. A further order was made that Moericus and the Spaniards should have assigned to them a city and lands in Sicily out of the possessions of those who had revolted from Rome. M. Cornelius was commissioned to select the city and territory for them, where he thought best, and 400 jugera in the same district were also decreed as a gift to Belligenes through whose instrumentality Moericus had been induced to change sides. After Marcellus’ departure from Sicily a Carthaginian fleet landed a force of 8000 infantry and 3000 Numidian horse. The cities of Murgentia and Ergetium revolted to them, and their example was followed by Hybla and Macella and some other less important places. Muttines and his Numidians were also roaming all through the island and laying waste the fields of Rome’s allies with fire. To add to these troubles the Roman army bitterly resented not being withdrawn from the province with their commander and also not being allowed to winter in the towns. Consequently they were very remiss in their military duties; in fact it was only the absence of a leader that prevented them from breaking out into open mutiny. In spite of these difficulties the praetor M. Cornelius succeeded by remonstrances and reassurances in calming the temper of his men, and then reduced all the revolted cities to submission. In pursuance of the senate’s orders he selected Murgentia [i.e. Morgantina], one of those cities, for the settlement of Moericus and his Spaniards.